Title: "Competing Populisms in Indonesia: Ultra-nationalists, Islamists and Technocrats”. 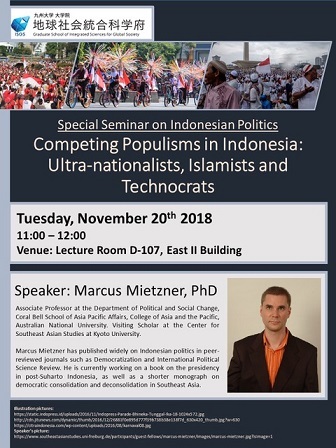 Speaker’s Bio: Marcus Mietzner is Associate Professor at the Department of Political and Social Change, Coral Bell School of Asia Pacific Affairs, College of Asia and the Pacific, Australian National University. He is also currently a Visiting Scholar at the Center for Southeast Asian Studies at Kyoto University. He has published widely on Indonesian politics in peer-reviewed journals such as Democratization, Journal of Democracy, Governance, International Political Science Review, Journal of Contemporary Asia and Journal of East Asian Studies. He is currently working on a book on the presidency in post-Suharto Indonesia, as well as a shorter monograph on democratic consolidation and deconsolidation in Southeast Asia.